Usually on Friday, I like to feature a picture that is about the Passion of Christ, since Friday is the traditional day of the Passion. 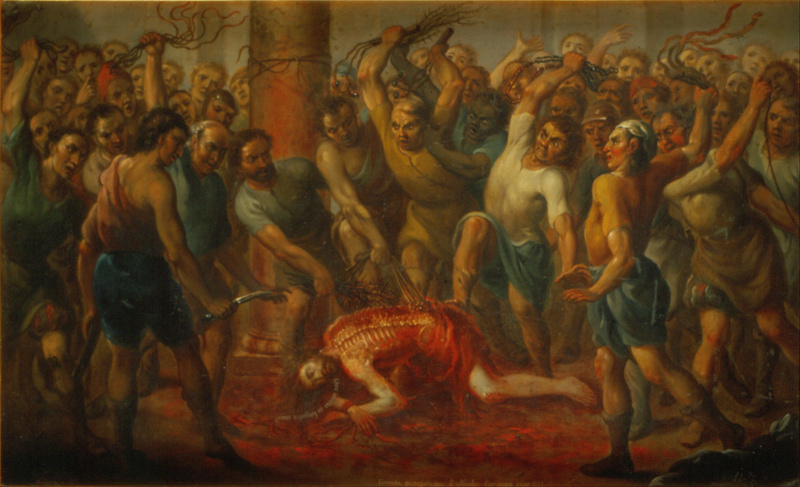 So, continuing on with the series of macabre religious art, I would like to feature this work about the Scourging of Christ, or, as it is commonly called in religious art, the Flagellation. This is… a really disturbing picture, first of all. I found it while going through public domain images of the Scourging of Christ that I could possibly use for my upcoming book, which pairs the Sorrowful Mysteries to religious artwork (which is set to be released in the US sometime next year, but will look similar to the book, The Joyful Mysteries in the way it’s laid out). Going through pictures of Jesus being tortured, mind you, is not easy in the first place because many of these pictures depict the brutality that Jesus went through in a startling way that is supposed to make you feel uncomfortable. For instance, while I was looking at pictures with my three-year-old peering over my shoulder, I found it difficult to explain to her what this picture of the Scourging was about when she asked me. The Flagellation, by Nicolás Enríquez, c. 1729. Museo Nacional de Arte, Mexico City, Mexico. In the picture, angry men armed with whips, chains, thorny sticks, and knives, flay off Jesus’ skin. Jesus, lying on the ground, asks in Latin, “Quae utilitas in sanguina mea?” Or, in English, “What use is there in my blood?” Thus, the artist asks us to really think about what the Blood of Christ really means and makes us realize that the Body and Blood of Christ was gotten for us at quite a high price and we should never, ever, ever take it lightly. But what horrified me probably the most was that you could see every bone in His back, as his back was utterly ripped apart. Automatically when I saw this picture, the scripture, “I can count all my bones” popped into my head. 1For the leader; according to “The deer of the dawn.” A psalm of David.2My God, my God, why have you abandoned me?Why so far from my call for help,from my cries of anguish?3My God, I call by day, but you do not answer;by night, but I have no relief.4Yet you are enthroned as the Holy One;you are the glory of Israel.5In you our fathers trusted;they trusted and you rescued them.6To you they cried out and they escaped;in you they trusted and were not disappointed.7But I am a worm, not a man,scorned by men, despised by the people.8All who see me mock me;they curl their lips and jeer;they shake their heads at me:9“He relied on the LORD—let him deliver him;if he loves him, let him rescue him.”10For you drew me forth from the womb,made me safe at my mother’s breasts.11Upon you I was thrust from the womb;since my mother bore me you are my God.12Do not stay far from me,for trouble is near,and there is no one to help.13Many bulls surround me;fierce bulls of Bashan encircle me.14They open their mouths against me,lions that rend and roar.15Like water my life drains away;all my bones are disjointed.My heart has become like wax,it melts away within me.16As dry as a potsherd is my throat;my tongue cleaves to my palate;you lay me in the dust of death.17Dogs surround me;a pack of evildoers closes in on me.They have pierced my hands and my feet18I can count all my bones.They stare at me and gloat;19they divide my garments among them;for my clothing they cast lots.20But you, LORD, do not stay far off;my strength, come quickly to help me.21Deliver my soul from the sword,my life from the grip of the dog.22Save me from the lion’s mouth,my poor life from the horns of wild bulls. …and, honestly, it’s eerie how much it seems to describe the Passion. From the description of the bones to the parched throat to the pierced hands and feet, so many details are of the Passion are there that it’s hard not to contemplate Jesus as using these words to describe Himself as He dies on the cross. 23Then I will proclaim your name to my brethren;in the assembly I will praise you:24“You who fear the LORD, give praise!All descendants of Jacob, give honor;show reverence, all descendants of Israel!25For he has not spurned or disdainedthe misery of this poor wretch,Did not turn away from me,but heard me when I cried out.26I will offer praise in the great assembly;my vows I will fulfill before those who fear him.27The poor will eat their fill;those who seek the LORD will offer praise.May your hearts enjoy life forever!”28All the ends of the earthwill remember and turn to the LORD;All the families of nationswill bow low before him.29For kingship belongs to the LORD,the ruler over the nations.30All who sleep in the earthwill bow low before God;All who have gone down into the dustwill kneel in homage.31And I will live for the LORD;my descendants will serve you.32The generation to come will be told of the Lord,that they may proclaim to a people yet unbornthe deliverance you have brought. And we are the generation that was unborn that proclaim of the greatness and saving power of God. After all, Christ has triumphed over death itself! Thank You for your sacrifice, which was done out of love. For the sake of Your sorrowful Passion, have mercy on us and on the whole world. It’s not the Sorrowful Mysteries, which is coming out next year, but you can check out the new book, Illustrated Rosary: The Joyful Mysteries, which is set to be released this year in mid-November!